The Trendy Sparrow: Want your wedding featured on our blog? Want your wedding featured on our blog? Hey everyone! 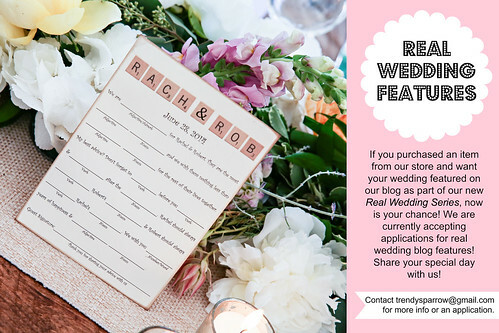 We are now accepting applications for our new Real Wedding Series! If you purchased a wedding item from our store and would like to have your special day featured on our blog please email us at trendysparrowATgmailDOTcom for an application! We would love to feature your special day on our blog! For more ideas, check out my Pinterest Board for chic weddings, classic weddings, and vintage weddings.